Okay, I don't do this very often, but today I would like to direct you to an article from the Milwaukee Wisconsin Journal Sentinel. It is a story about a farm kid who plays in the NFL, but who still has deep roots in the Kansas farm ground. 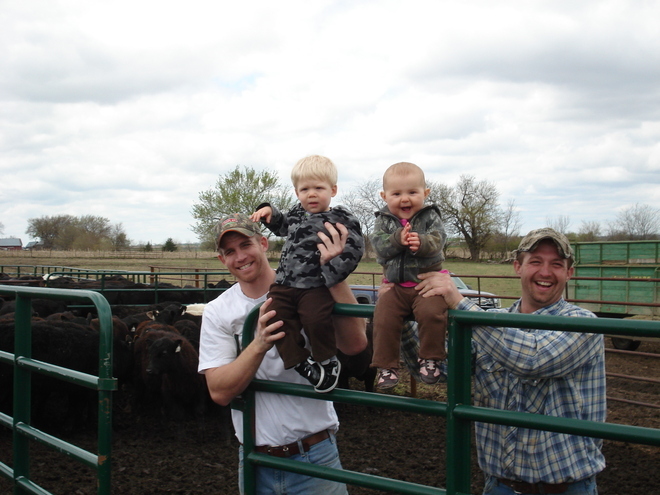 Jordy Nelson (at left), Green Bay Packers Wide Receiver poses with his son Royal, his brother Mike and Mike's daughter Izabel in front of a pen of calves at Nelson's Angus Family Farm in Kansas. Photo printed in the JS, but is a Nelson family photo. Jordy's sister is married to a guy from our small town. Their slow pitch softball team often plays at tournaments in our little town. Jordy plays on the team as "just one of the guys" and everyone treats him as such!...although he hits a homerun at nearly every at-bat! The author of this news story seems to understand the ties to the land that farmers and ranchers feel. When a kid is raised working side by side with grandparents, parents, siblings, and even cousins they learn the value of hard work, the satisfaction of a job well-done, and they are forever tied to the land and the environment and want to do everything they can to protect and improve it. I'm always impressed when I read a story of a farm kid who hits the "big time" and still maintains their roots. Jordy Nelson has done that very successfully. Recently, my husband and I attended a dinner meeting at the Nelson family's restaurant Nelson's Landing, and we sat by Jordy's grandfather. He is a proud grandpa and spoke highly of all his grandkids. Jordy's sister Kelsey served as our waitress and we visited with her about her husband--the guy from our little town. This family has done it right! These kids have grown into well-grounded, actively-involved adults. They are not "stuck" in a little farm town, but they seem to be drawn to it and appreciate the importance of farming. As a farm mom, I want to say "Congratulations" to their parents! I'm proud to be able to raise my kids on a cattle ranch. I think they are happy to have had that opportunity, too! Wondered recently why I hadn't seen a post from you on FB. Sounds like everything is OK. I've been renovating my backyard after losing almost everything to last year's drought. Have a wonderful, successful, peaceful summer. We got rain!! Last night nearly 1 1/2" of rain fell on our ranch. So, with the moisture, my plans for the day totally changed, and I decided to catch up on my writing and try to uncover my desk...that is a big job. I also need to fold a LOT of laundry!! Yuck. I'm sorry to hear of the loss of your landscaping due to drought, but it sounds like you are turning it into a positive by renovating! What kind of plants are you using? Ones that withstand drought better? I have a lot of native plants in my yard because if they can grow in our pastures naturally, I have some kind of chance to keep them alive in the yard! Well this is very interesting indeed. Would love to read a little more of this.Great post..